I am a big woot woot to share with you today. The annual edition of Australian Cardmaking Stamping & Papercraft is now available to purchase. This edition is jam packed with so many inspirations and tutorials. It is a must have in my opinion. I am truly blessed to be on the cover of the magazine with this Father’s day card. I am pretty proud of this card and was a bit restless waiting for so long to share with you. I did share a picture or two of the making of the card long time ago in my Instagram. But I am very thrilled with how this card turned out. 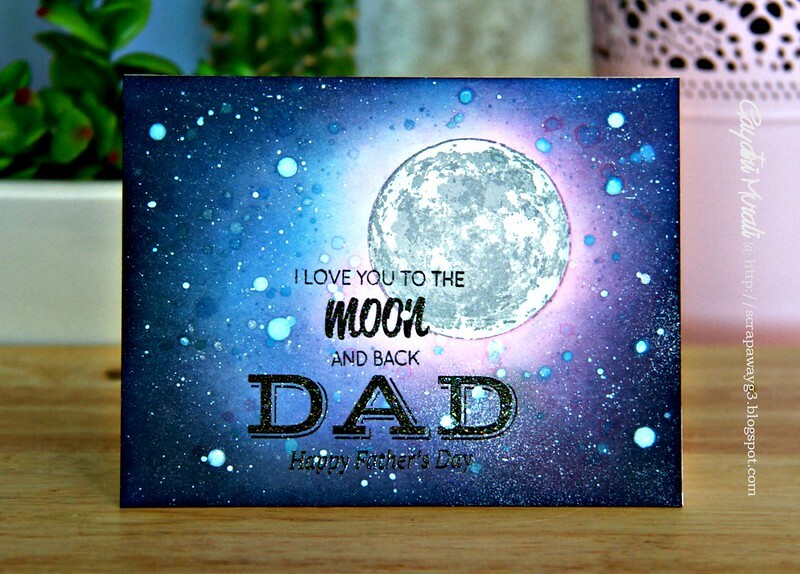 I have used Altenew’s To the Moon stamp set on my card, sponged the night sky background using distress inks. The sentiments were from two stamp sets – Altenew’s To the Moon and Parentville from Winnie & Walter. Apart from this card, I have a double page 1 die 4 ways feature showcasing four different ways to feature a die. Also a tutorial on Watercoloured die cuts. If you like to subscribe, click here! The magazine is available to purchase at news agents and supermarkets. Congratulations! I love your Father's Day card! What a gorgeous background! fantastic card. Congrats on getting published. Love getting my mags and seeing your cards there. Fabulous cards and congratulations on the well deserved publication. Congratulations Gayatri – not only on the publication (front page no less!!!) but a truly fantastic card! Congratulations!! Thats awesome news and to be on the cover is super amazing. How many copies of this will you buy I wonder???? Your card is spectacular, so can totally see why it was chosen.